We had a good day, although it was an emotional and busy one. It started out with the girls (granddaughters) going to their first counseling appointment. This is something that they have needed to have in place for about 6 months, but just wasn’t possible until recently. I am very blessed to have found a wonderful woman that the girls instantly “clicked” with. I must admit that I wasn’t prepared for the reaction that I saw in the youngest granddaughter, Natalie. I knew that Angela was going to find it easy to talk with a counselor, and I thought that Natalie would just follow along. However, what I saw today after our initial “meet and greet” with the counselor was a little girl who was all of sudden faced with the fact that she might have to deal with some of the feelings that she has been burying down deep. Because of her age, she doesn’t know how to verbally express that, so instead, those emotions and fears come out in her behavior. She has always been the happy child, that is always smiling and doesn’t let you know that she is upset by anything. However, what I saw today after our counseling appointment was a little girl that was crying at the drop of a hat and being extremely combative . She is hurt, mad and confused. It breaks my heart to watch them go through this, and all I can do is love on them and pray. 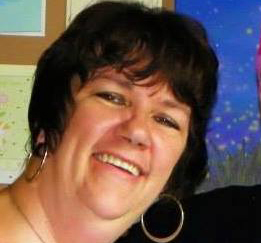 Her sister, Angela, is the child who “wears her heart on her sleeve”. She has no problem verbalizing what is going on and how she feels about things. They are very much like a lot of sisters, total opposites. I am thankful that both of them have begun the process of starting to sort through all the feelings and emotions over how their life has changed this past year. I pray that God gives me the words and wisdom to help guide them, to help them become the beautiful , healthy strong young women that I know they will be. 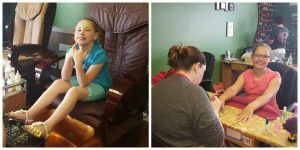 After our emotional morning, I decided it was time to go have a little pampering time, so off to the Nail Salon we went. They both got to pick out a Nail design they wanted . 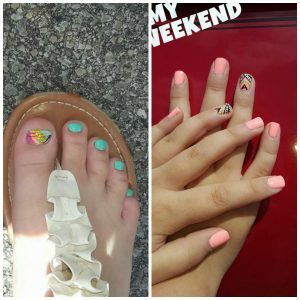 I loved the design that Natalie picked, although I have to say, it was a challenge for our Nail Tech to get it on her tiny little toes. Once again, total opposites. Natalie had her toes done and Angela had her nails painted. We rounded off our day with their Softball game, which we WON! It was only the second game of the season that they have won, so it was a great end to a busy Saturday!